Automatic dome satellites have been on the market for a number of years and definitely deserve some consideration before choosing a satellite system for your motorhome or caravan. Let's see if we can weigh up the "pros" and "cons" to help you make your mind up. Dome satellites are cheaper to buy than a conventional clamshell automatic satellite dish. Automatic dome satellites are easy to use and very often operate with the touch of a single button. The outer shell of a dome satellite will protect the dish from harsh weather conditions. You can enjoy satellite television even in high winds. The dish inside a dome satellite can be a much lighter duty which can really bring the weight down. The Auto Vu Dome and the Roadpro Dome weigh as little as 8 KG. Relatively simple installation with few cables. And now the things to consider. The main downfall to a dome dish is the size of the dish itself. The height of the dome has to be kept to a minimum which means the dish inside a dome is normally around half the size of an elevating clamshell dish. The knock on effect from this is a reduced footprint (Area where you are likely to receive satellite TV). As mentioned in the section above satellite domes definitely tick a number of boxes but have one main floor "the range", this is only a problem when travelling abroad and wanting to receive "Free To Air" channels from Astra 28. Realistically dome satellites work very well throughout the UK for all channels but when travelling through France the range is limited. 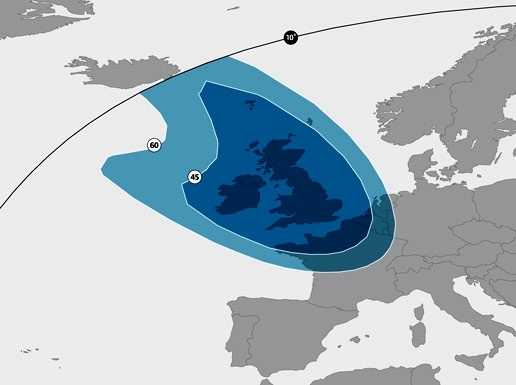 Channels broadcast on Astra 2 f and E (free to air channels) will be limited to Northern area whereas Sky channels which are currently broadcast on will give range to mid-France. Here is a link to Google maps page where people have reported their finding with Astra 2f people feedback satellite range for Astra 2 f.
SatFi UK+ has been specifically designed for the UK market. Unlike a number of dome satellites, the height has been kept to an absolute minimum. With an overall height of just 26cm, this robust little unit is definitely worth some consideration. Setting the benchmark for satellite dome technology with regard to performance and features is the SatFi EU. This being because it is the first full-size 36cm dome to use a Cassegrain reflector that is high gain. Fitting for this product starts at £150 and will vary depending on vehicle type and travel. If you would like to inquire about having a product fitted by ourselves please Click Here and fill out the details. Once we have received your details a member of staff will contact you to discuss a quote for fitting.